Your favorite product: A belly Piercing made of steel, pure zirconium cat with ribbon K7.14 - is added to the wish list. A steel piercing in the belly and pendant - seated cat with bow, sheer cut rhinestones. Your favorite product: Puzetové steel earrings, different designs, sheer glaze AB28.01/20 - is added to the wish list. Earrings made of surgical steel with different images, cast-in-place reservoir a transparent glaze, puzetové fastening. 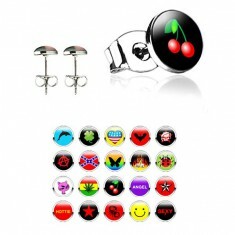 Your favorite product: A steel piercing in the tongue - is added to the wish list. Piercing in the language of steel, round head, transparent glaze, color images.